Starred Review. Pelecanos (Drama City) delivers a dignified, character-driven epic that succeeds as both literary novel and page-turner. In 1985, the body of a 14-year-old girl turns up in a Washington, D.C., park, the latest in a series of murders by a killer the media dub "The Night Gardener." T.C. Cook, the aging detective on the case, works with a quiet, almost monomaniacal, focus. Also involved are two young uniformed cops, Gus Ramone, who's diligent, conscientious and unimpressed by heroics, and Dan "Doc" Holiday, an adrenaline junkie who's decidedly less straight. To enter to win one of five copies of this book, just post a comment below. Also please be sure to leave me your email address if you don't have a blog or it's not in your Blogger profile. I usually pull at least one winner with no email address each giveaway I host. For five extra entries blog about this giveaway and leave me the link in the comments (sidebar is ok, too). Open to US and Canada only, no PO boxes please. One main entry for each unique review comment. Twitter entries can be done once a day. Giveaway ends July 14th and the winner will have 48 hours to respond to the winning email or a new winner will be selected. ohh... this sounds like a real page-turner! Can't wait! I just have to read this book - it sounds so good. It sounds so good. Thanks! I'd never heard of this author till about 2 weeks ago. The titles I've seen since then sound really interesting! This book, according to your review, will definitely be put on my TBR list. Sounds like a can't put down, page turning read. Will be following blog to get news on more great books. Hoping I win this one !! This book sounds terrific. Thanks for the chance to win a copy. This sounds like a very good book to curl up with on a rainy day. Thanks for offering the chance to win it. 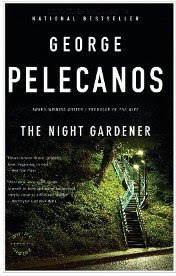 I've never read anything by George Pelecanos, but this book sounds really interesting from your synopsis. I love to read; especially books like this. sierramuse8 at aol dot com. I subscribe/follow via google reader! I would like to add this book to my summer reading list. Thanks for the giveaway I want to read this book! The Night Gardener sounds great. I would love to read this book. I would so love to have this book! I am an avid reader and his work is so gripping. This would be perfect to take to the beach. Thanks for the chance. Great author - would love to win! Sounds like a great read. Would love to add it to my library. This book sounds excellent! Please put my name in the hat. Thanks. This book sounds really interesting. I love to read and hope I win this. I keep hearing/reading how good this book is! Maybe it will soon be mine? Thanks for the chance to will some good summer reading! This is my genre. The plot was most intriguing. I'll take a good tight thriller. I love a good mystery. Please enter me! Nothing like curling up with a good book and a cold drink on a summer night. Thank you for the chance to win. I've read some good reviews, would love to read this! Thanks for the giveaway! This sounds like a great book. I would love to read this one. Please enter me. Thanks! This would be a new author for me but I heard great things about him. Thanks for the opportunity! This sounds like a book I could really get into! I love a great thriller and this sounds like one! Thanks! I'd like to win! I follow your blog too! Christina - xristya@rock.com - I'd love to win this book = I read his book The Way Home and it was very good! I would love to read this. It looks good. i really would love to win this book, it sounds so good! I'd love a chance to win this, thanks! This sounds like a great read. I would love to win. Crazy about murder mysteries, please count me in! Oooh I this book sounds awesome. I love a good mystery! I would love to read this, I hope I win! Thanks for the chance! I have heard really good things about this book. Thanks for the chance to win it, I am a total book addict! Would be fantastic to win! I also subscriber via email. THis book sounds great. I have been hearing lots about it and would love to win a copy. I am a George Pelecanos fan! COunt me in. I'm looking for a good book to read! This teacher could use some summer vacation reading! I love to read and need a new book. This sounds like it will fill the bill. Would love to curl up with this book. Thanks. I would love to read this one! Thanks for the giveaway! Please enter me to win this book. It looks like a great read. Thanks for the giveaway! This book sounds interesting. I would like to read it.